The world is in ruin. Men, elves and Dwaro mistrust each other. The gods have foresaken mortals. Remains of empires molder. Ancient forests lie desolate. Amid the wreckage small bands of people live on the edge of ruin, beholden to warlords for protection. Eight hundred years before, the human Algorand Empire ruled the world. It was a time of peace and immense prosperity. Tens of millions lived under the firm hand of the emperors. Then, the Imperial College of Wizards caused a Cataclysm that destroyed the Imperial capital, weakened magic and started the great ocean tides that plague the world to this day. Immediately after, millions died as famine set in. In their underground halls, nearly all Dwaro died as the magic they relied on failed. Only the elves, high in their trees, avoided the worst of the Cataclysm. NEW: See Paragon Tier for where the campaign is picking up late spring 2011. 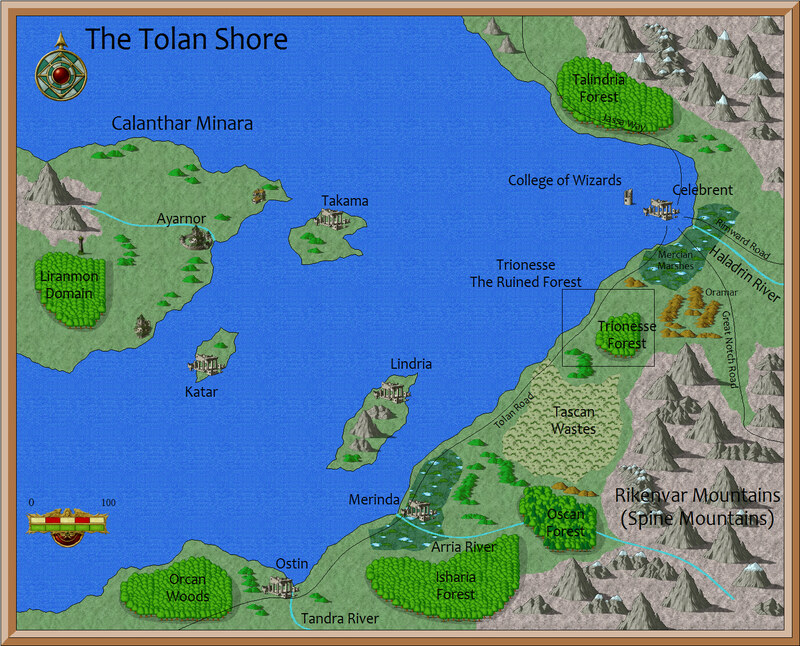 This campaign begins in the Trionesse region of the Tolan Coast using the D&D 4E rules with characters starting at first level. Suggested Reading: suggested pages for players based on race and class of their characters.